Meridian Mayor Tammy de Weerd and Boise Mayor David Bieter. Photos: City of Meridian, City of Boise. It’s an election year in the cities across the Treasure Valley. And the two officeholders who have some of the biggest impacts on growth will see their seats again go before voters. Boise Mayor Dave Bieter and Tammy de Weerd are fixtures in local politics. Both took office in 2004 and have steered two of the state’s largest cities for more than 15 years. BoiseDev undertook an extensive analysis of the 2015 campaign finance records for both mayors to provide a better understanding of where the dollars that funded their campaigns came from. We pulled the 2015 campaign finance reports for both De Weerd and Bieter, and manually entered them into a digital format. Most of the reports were scans of faxes and were not machine readable. We then cross-referenced each individual donor by working to determine who they were, based on name and address. Many were easily identifiable, and most could be attuned through Google or LinkedIn. In a few cases, it was not clear who the donor was – these folks are labeled as “unknown” in the analysis below. Once the individual was matched, we categorized each one by occupation: legal, development, healthcare, general business, fire union, political, staff member, other or unknown. In some cases, a donor could fit in several categories. For instance, council member Scot Ludwig gave the mayor $1,000. Ludwig is an attorney, a developer and a politician. In those cases, we made a judgment call on where they best fit. In a dataset this large, with so many variables, it’s possible a few donors are miscategorized. If you see an error, email me at don@boisedev.com. BoiseDev’s Deep Dive projects like this are made possible by members of BoiseDev FIRST. Join today and get great benefits, like a daily newsletter full of stories in your inbox. Based on the address for each donor, we categorized them into the candidate’s home city (Boise for Bieter or Meridian for De Weerd), other Ada County, other Idaho or out of state. During the 2015 cycle, De Weerd won reelection in a landslide, grabbing more than 78 percent of the vote. She took in $36,030 in donations according to her annual report for the year, from a total of 116 donations. That equates to an average of $264 per donor. Only seven of the donations made hit the $1,000 level – the most allowed in an election cycle by Idaho law. Forty-percent of all donated dollars came from donors with a Meridian address. A larger share, 58% came from areas in Ada County outside Meridian, primarily Boise. She received just a single out-of-state donation: $500 from city trash contractor Republic Services. The largest category of donors to De Weerd’s campaign came from the development community. Forty-five percent of all dollars raised came from a firm or individual we would identify as in the development industry. Several donors tied to Boise Hunter Homes make up a significant portion of the development haul. Boise Hunter Homes, BHH Madelynn Estates LLC and BHH Hidden Springs all gave the maximum allowed by Idaho state law: $1,000 each – for a total of $3,000. Development industry donors made an average contribution of $432.94. The business community also presented a strong fundraising source, with an additional 33% of donations. The remaining 22% of dollars raised came from folks in legal, healthcare, political or other/unknown fields. During the 2015 cycle, Bieter handily won his race against two other candidates, with nearly 69% of all votes cast. He raised significantly more than De Weerd, $212,337 according to his 2015 annual report. Our analysis shows he took in 459 donations, with an average of $450 per donation. For Bieter, 159 of the donations made hit the maximum $1,000 level. The large majority of Bieter’s donations in terms of dollars came from donors with a Boise address – 74%. Another 9% came from other portions of Ada County, 9% from out of state and 8% from Idaho’s other 43 counties. Of the dollars raised, 29% came from donors we identified as coming from the development community. This includes a maximum $1,000 donation from a who’s who of developers: Hawkins Properties, Oppenheimer Companies, Inc., Boise Hunter Homes, Tommy Ahlquist, Ada Co. Assoc. of Realtors, ESI, Guho Corp., LocalConstruct, the family that controls Harris Ranch and more. The average donation from a development community member rang in at $752 – the highest for any category we studied. The general business community chipped in 25% of Bieter’s contributions. Nine percent of dollars came from fire unions across the northwest. In addition to the Boise Firefighters PAC, firefighter unions or PACs in Washington State, Blackfoot, Chubbuck, Coeur d’Alene, Eagle, Ketchum, Middleton, Nampa, Pocatello, Kootenai County and Washington, DC all gave $1,000 a piece. Additional unions in Sandpoint, Seattle, Spokane and Montana contributed smaller amounts. In all, nearly $18,600 came from donors we identified in the fire union category. Folks in the legal field also chipped in nine percent of contributions. The remaining dollars came from healthcare, political, staff members or unknown/other sources. 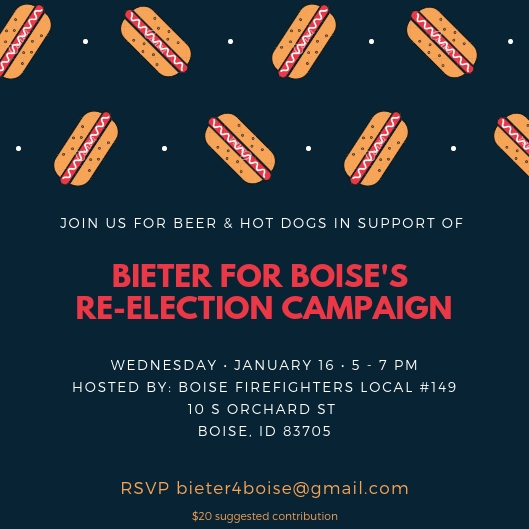 In Boise, Bieter has already filed his candidacy to run again in 2019, and started raising money. One challenger has already entered the race, Adriel Martinez – an Army Veteran and Nampa HS graduate. In Meridian, no candidates have formally declared their intent to run. De Weerd’s spokesperson told BoiseDev she mentioned running again during her 2018 State of the City, but hasn’t formally made a declaration.